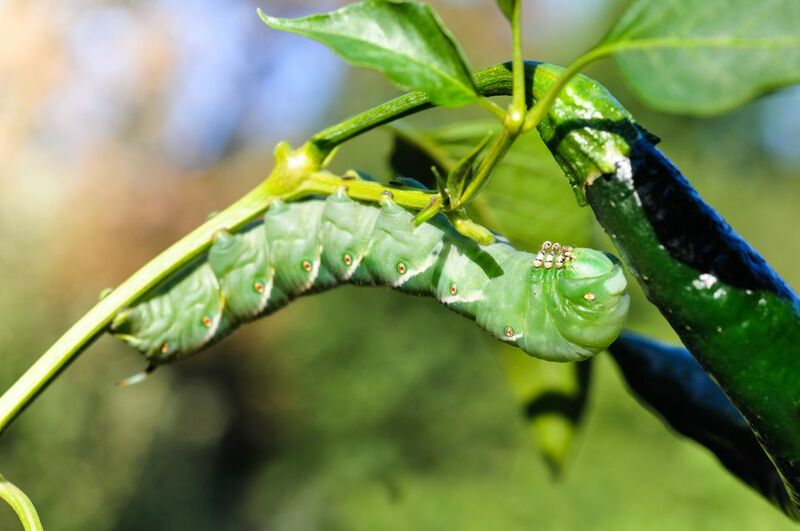 While nothing can guarantee you won't have pest problems in your vegetable garden, there are some low effort ways to cut down on the pest population. Basically, you want to avoid the conditions that invite pests into your garden in the first place. These five tips will help keep your plants healthy and problem free. We've all been guilty of trying to squeeze in as many plants as will fit in any given space (and then some). This will give you a temporary sense of abundance, but can easily lead to trouble in the long run. It's crucial that your garden gets some air circulation form a good breeze on a regular basis. Tightly packed plants are very inviting to feeding insects that enjoy both the shelter from the heat and the cover from predators. They will raise their families in there and eat their way out. So if you must plant closely, you will need to monitor for pests more frequently. This one is always easier said than done, but we have to give it our best shot. If possible, water in the morning. This offers two advantages. First, your plants will be well hydrated when the hottest part of the day comes around. They'll be less apt to wilt and become stressed. This makes them less appealing to insect pests who prey on stressed plants. Secondly, the leaves will have time to dry off before evening. Damp plants, especially if you also have the tendency to plant things close and densely, are ideal hangouts for many garden pests, like slugs, snails, and earwigs. And it's better to water deeply once or twice a week than to only wet the surface of the soil, and the leaves, on a regular basis. Annual plants may need even more water since they tend to have a more shallow root system. As for unaccommodating rain, a little is always welcome. A lot can cause trouble. You'll just have to keep an eye on things and wait until the garden dries out. Make your garden welcoming to animals that feast on insects. Frogs and toads top that list. Sometimes all it takes to invite them is a bowl of water. Put out a toad house and wait to see if anyone takes up residence. Often they simply carve out a depression in the soil where they wait quietly for insects to eat for dinner. Birds get a bad rap in the garden. They do eat and nibble the fruits, but they also chow down on their share of insects, which are excellent sources of protein. You don't usually have to go out of your way to attract birds to your vegetable garden, as long as they are already in your yard. If they aren't you'll need to plant more food sources for them and provide some trees and shrubs for shelter. They don't like feeding in the open, without a nearby place to hide from predators. And just like their amphibian co-workers, they appreciate a source of fresh water. Sometimes it's hard to know who the good guys are. Not every insect comes to your vegetable garden to chow down on your harvest. Some are carnivores who will quickly reduce any population of pests the way no pesticide spray could. They don't wear white hats, so you'll have to educate yourself to what they look like. This includes all stages of their development. The ladybug nymph, shown here, is not a pretty sight, but it is a vacuum cleaner when it comes to aphids. It doesn't take much to attract beneficial insects. The trick is trying to keep them around when all the pests have been eaten. But beneficial insects need pollen and nectar, as much as the protein from other insects, so having the plants that they favor will keep them periodically checking in, if not permanently moving in. An easy way to accomplish this is to allow some herbs, lettuce, and cole plants to go to flower. Generally falling behind on your harvest isn't a problem, but fruits falling off the plants and plopping to the ground are an easy mark for insects. And any overripe fruit or vegetable still clinging to the plant tends to shift the whole plant into decline and weak plants are the first ones that insects target. Be sure to clean up any fruits that have fallen. If your zucchini or beans have grown to an embarrassing size, harvest the over-sized fruits and then give the plant some extra water, a light feeding, and then give it time to recoup. In the meantime, be on the alert for any opportunistic pest who might try to make their move.